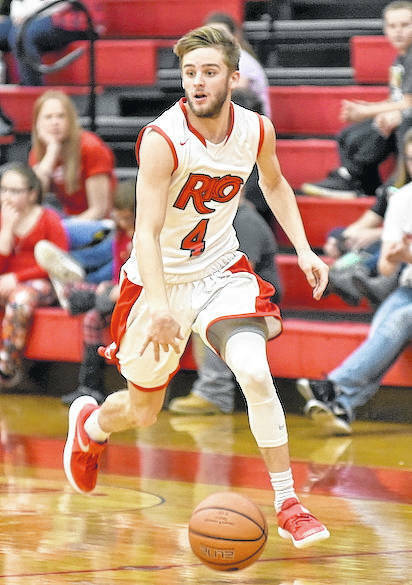 Rio Grande’s Jaxon Burgess nailed a three-pointer with 11.8 seconds remaining to lift the RedStorm past Truett McConnell, 81-78, in non-conference men’s basketball action at the Newt Oliver Arena. In its final game of he 2017 calendar year, the University of Rio Grande men’s basketball team proved that there was a way without a Will. With senior point guard Will Hill – and his team-best 22-point per game average – sidelined by an undisclosed medical issue, the RedStorm rallied from a 14-point first half deficit to outlast Truett McConnell University, 81-78, Friday evening, in non-conference action at the Newt Oliver Arena. Rio Grande improved to 7-9 with the win, its third straight triumph and fifth victory in its last six outings. Truett McConnell, which was among the teams receiving votes in the most recent NAIA Division II coaches poll, slipped to 12-4 with a second straight loss. The back-and-forth affair featured 11 ties and 13 lead changes, although nine of the ties and all but one of the lead changes didn’t happen until the game’s final 11 minutes. The Bears used a 10-0 scoring spurt to open up a 14-point lead, 24-10, following a bucket by Filipe Goncalves with 9:12 left in the first half, but Rio slowly chipped away and sliced the deficit to four late in the period. The RedStorm kept coming in the second half, forging a 49-all tie on a jumper by senior Devon Price (Pickertington, OH) with 11:12 remaining and taking its first lead of the contest on a pair of free throws by sophomore Greg Wallace (Montego Bay, Jamaica) just 44 seconds later. It was Truett McConnell, though, who found itself enjoying a five-point advantage, 77-72, after a conventional three-point play by Calvin White with just 1:26 left in the game. Rio responded once more, however, by reeling off seven straight points and taking the lead for good on a three-pointer by freshman Jaxon Burgess (Louisville, KY) with 11.8 seconds remaining. The Bears made it 79-78 after Mario Westbrooks hit one of two free throws with 3.9 seconds remaining, but Rio junior Abe Eze (Lagos, Nigeria) hit one of two attempts from the charity stripe with 3.3 seconds left and – after a turnover by TMU on the subsequent inbounds play – freshman Trey Kelley (Minford, OH) hit one of two free throw tries with 2.3 seconds remaining to set the final score. The Bears’ last-gasp hope for a game-tying trifecta to force overtime ended with a turnover on the game’s last play. Rio Grande totaled a quartet of double-digit scorers and was led by sophomore Stanley Christian (Norfolk, VA), who finished with a game-high 25 points and 12 rebounds. Burgess netted 17 points in the victory, while Wallace had 12 points and a career-high 10 rebounds and Eze finished with 11 points – all of which came in the second half comeback. Westbrooks had 22 points to lead four double-figure scorers for Truett McConnell. David Campbell added 20 points in a losing cause, while Christian Davis and Myles Monroe finished with 13 and 10 points, respectively. Monroe also had a team-high seven rebounds and three steals, while White also tallied seven rebounds of his own. Rio Grande returns to action next Thursday when it opens a two-game River States Conference road swing at Brescia University.